Badgers Holt is set in the scenic Limousin region of France alongside its sister lake; Lac Serriere. Last year I decided that these two lakes would be my main focus in 2016 with the anticipation of catching the largest residents from each at some point in the season. The lake itself is small with two main swims. The carp can be caught from any part of the lake so you need to have your eyes on the lake at all times. Three trips in all were planned for 2016, two on Badgers Holt to take place during the spring and summer and the final trip to other lake would be arranged in November (just before the complex closes for the winter). My first trip to Badgers Holt took place in the middle of May. I was hoping that at this particular time the carp would not have spawned or in fact even begun preparations. What I needed was for them to be all consumed with a need to feed. 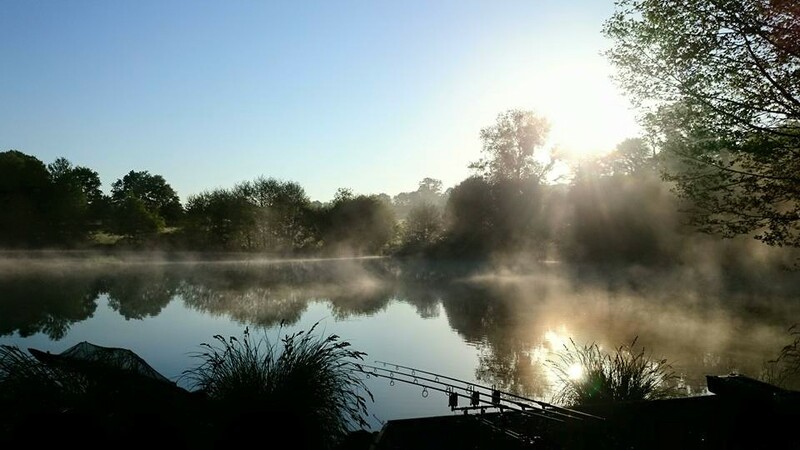 I began taking note of the catch reports in April and carefully monitored the weather and what had been fed by different successful anglers before I decided my own plan of action. The water over the years has seen it all and the carp are no mugs, so in my own mind I knew what kind of rigs I was proposing to use. What I noticed in particular was that the anglers who fished the week previous had only lightly baited, so I planned to do the exact opposite to encourage the fish. But I still needed to be mindful of air pressure as this has to be just right if you propose to bait as heavily as I planned. Two of us fished the lake and we agreed to swap swims halfway through the week to make the days a bit more interesting. As we were using the same bait I was not overly concerned that the fish would make preferences, but as it turned out we fished as a team anyway. The two largest fish had been caught already this year which was not unusual but unfortunately they then normally disappear until the autumn. I decided that as the weather was cool with a northerly air stream my best plan was to start baiting heavily from Sunday. As hoped there was no sign of spawning so I set myself my normal target of seven carp for the week. So for the first part of the week I fished on the left side of the swim where all the fish were caught the week before and where I had observed them sitting in the shallows and underneath the bushes. Although these were promising signs I still had doubts I was in the right swim but I baited up hoping the carp would move into my area within the next 24 hours. As the lake is under 3 acres it is possible to hold the fish in an area but only if you get the baiting right. Firstly, I baited along the dam wall just past the monk. Secondly, in what is known as koi Corner and finally underneath some bushes on the right side of the lake. My bait choice was Mainline baits Hybrid boilies in mixed 10mm and 15mm sizes along with plenty of chops. Also mixing up Hemp soaked with Multi-stim and Hybrid stick mix liquid with maize added for a bit of colour. My friend Chris fished two rods down towards the shallows and the other rod in open water but he put in less feed which may have reflected on the variations in the fish caught. 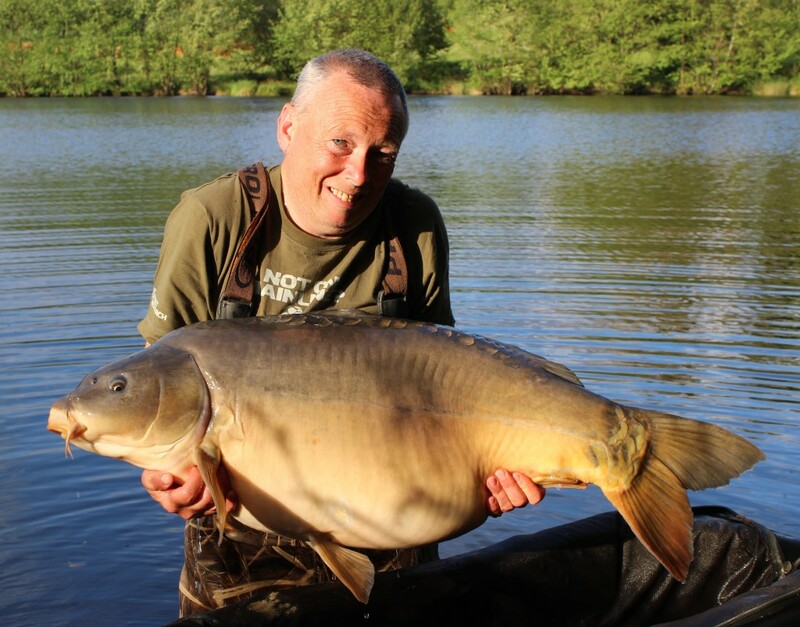 The first night Chris had an impressive big fifty down the shallows which was a good start on this lake. I ended up with only a few liners. The next day I went around the lake and trickled some more bait in my area and I also took the time to look at the shallows where a lot of fish were lying up with the resident Koi. I put some more bait in there to help Chris and he then went on to have a couple more fish; another good fifty and a forty. I had my first carp from the far end of the lake; an upper forty and having seen no signs of carp in that area earlier I was pleasantly surprised. In front of Chris carp were still showing themselves. After having another walk around I advised Chris to put his rig under a bush in the shallows which was less than 3 feet deep. Within an hour Chris had a carp from that spot. Disappointingly, that night my swim was quiet. The next day I spent a lot of time observing and planning where to move my rigs. When Monday night came, just before dark, Chris was rewarded for his efforts again with a large carp that turned out to be a seventy plus mirror. This beauty was caught on Mainline Hybrid and was hooked just underneath a bush which normally gets overlooked. An amazing fish and Chris had beaten his personal best. Tuesday Morning, the planned swap went ahead and conditions still looked good for the shallows, but fish had started to show all over my original areas. I was up and about as the sun started to rise and noticed a few fish were showing in open water. But I have to say if you had not had your eyes on the water you would have missed them. Some of the most interesting shows on Badgers are extremely subtle and probably missed by many. They looked like small fish but I knew they were large carp just pushing their mouths or top dorsal fins out. There were also a few feeding bubbles just coming up to the surface of the water. So I started to bait up heavily under the bush and an area opposite where there is a nice marginal shelf. I increased the baited area and also baited between the spots with some boilies, so carp would find the bait and follow to either spot where my rigs were placed. For the bush area the rig I used was a KD rig with a long hair baited with a 15mm bottom hybrid boilie and topped with half an essential cell popup dumbbell. The marginal shelf rig was a white Hybrid chopped popup boilie and the third rod was the same as the bush rig but fished in open water. By the afternoon I had picked up a small fish in open water but sadly that was it until Wednesday. Then the weather changed to rain which seemed to slow things down. I was beginning to get a little frustrated and decided to go for it on the bait side. My thoughts were really to get the carp on the bait as I knew there were a lot of fish there, even though Chris had had more success in other areas. So as Thursday arrived the wind was back pushing down to the shallows and shortly before 9am my open water rig was away and a nice conditioned mirror was caught weighing in at 49 lb. 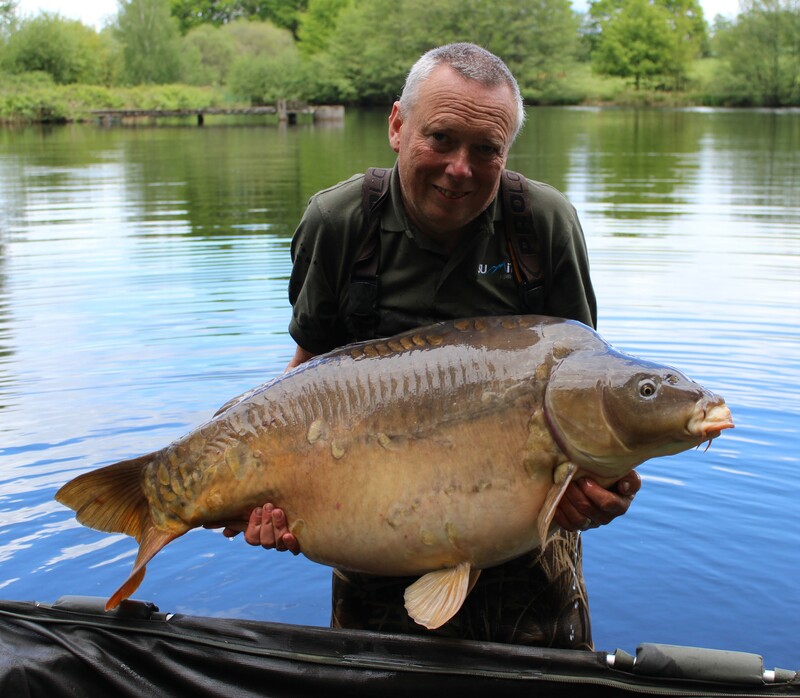 This fish was caught over two kilos of different sizes of boilies, hemp, pellet and crushed maize soaked in Multi-stim and Hybrid stick mix liquid. My next fish was a cracking fifty from the marginal shelf caught on the pop up. This particular carp put up a fantastic fight. After weighing the fish, I noticed my sling was full of digested hybrid boilie so I knew I was onto something and the fish were obviously on the munch, so I decided to keep piling in the bait. The more I fed the better the results seemed to be. My efforts and patience were then duly rewarded and the next screaming take offered what felt like a very powerful fish. It was a good twenty minutes before we even saw it. Frightened of losing it due to big loss earlier I felt nervous and played it cautiously and when it at last showed I could see it was a large common. I could not wait to get it in the net. Once this was achieved, I cut the line folding the landing net and put it into the sling before lifting her out of the water. I struggled to lift her into the unhooking mat, but this was not surprising as she came in at 63lb 2 oz. Result! I had just landed the biggest common in Badgers Holt. Once the photos had been done out went the rig on the marginal shelf then to my delight all hell let loose as the bush swim gave me 7 more carp in quick succession – all upper forties and yet another fifty. The key was to keep heavily baiting the spot. The number of big fish was simply staggering. So by Friday morning I had had 9 carp in less than 18 hours. Chris continued to do well and by the evening we had 17 carp in total and lost a couple so both of us were happy. The bush swim had gone quiet but overall we were amazed how many we took from it. We planned an early night as we had such a long journey home, but I wasn’t to get the rest I expected. At 10pm we both settled down. Then at 10.30pm the bush rod had a take with the bobbin sitting tight against the delkim and the rod tip just twitching. So I struck and felt that I had snagged a branch or something. Then it started to move and realised I had hooked something heavy. At this point I really didn’t know what I had on the end of the line and expected, if it was indeed a fish, it could perhaps be an upper fifty or a sixty. Well it finally went in the net and at that moment I realised it was JoJo the famous mirror. She felt so heavy, even just trying to get the net from underneath her. 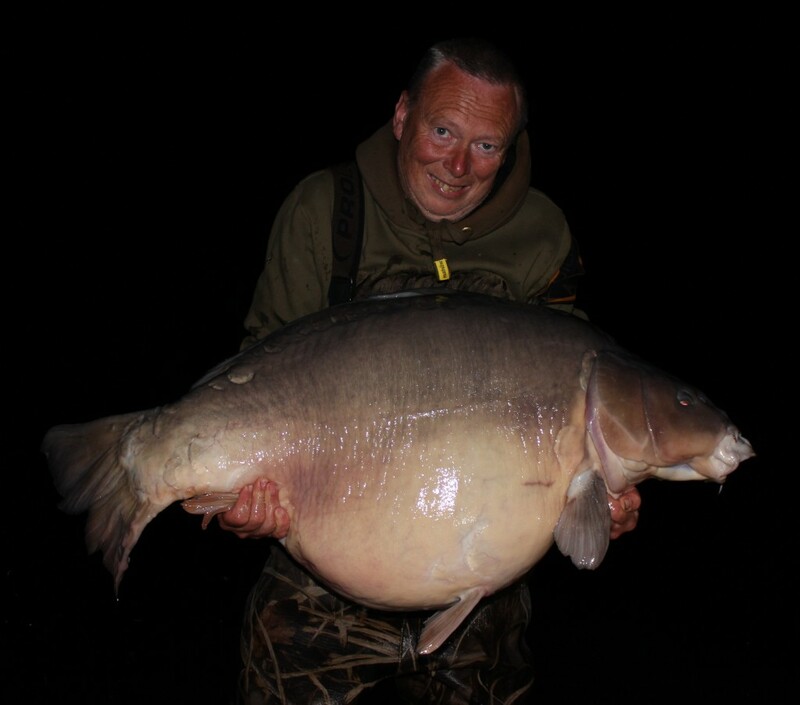 We both tried to lift her and she tipped the scales at an amazing 76lb 14 oz. My new personal best. I was ecstatic that after my slower than expected start I had had JoJo plus the big common and 9 other really big carp as well. In the end Chris and I totalled 19 carp, including 2 x 70s, 1 x 60, 6 x 50s, 8 x 40s and only a couple under 40lb. 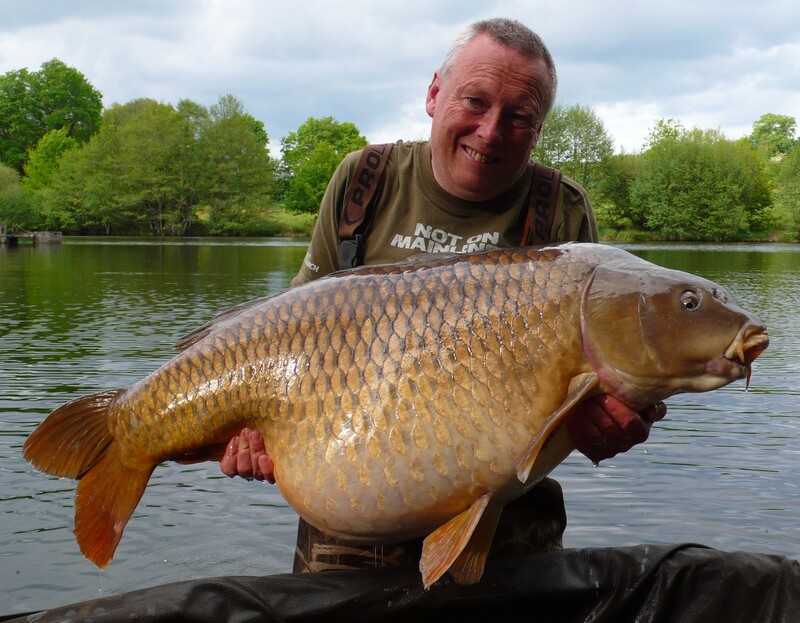 The average weight was around 49lb! We used over 50kg of bait and I felt was this was the key to our success on this challenging lake. Not only the bait quantity, but also the bait quality has to be perfect for this rich lake and its tricky inhabitants. However, a lot also has to be said for the meticulous monitoring and planning we undertook in preparation for the trip to Badgers Holt.